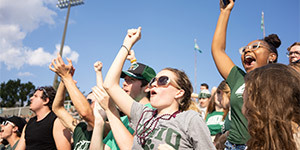 At Ohio University, you can be yourself—and become your best self. OHIO’s nationally accredited academic programs make us a perfect choice for those seeking a comfortable midsize campus with the amenities and resources of a larger school. Our goal is to offer students the nation’s best transformative learning experience. Interested in journalism, teaching, video production, graphic design, engineering, or astronomy? How about studying international business, researching ways to improve health care, or solving environmental problems? No matter what you want to do—from learning to fly a plane to studying the biology of dinosaurs—you’ll find your right fit here. You can even design your own major through our Bachelor of Specialized Studies program. OHIO is known for more than its beauty—it’s a welcoming place where new friends are waiting to meet you. It’s the university that fits who you are—and who you want to be. More than 90% of our first-year students choose to participate in learning communities, which group a small number of students with common academic interests into a cluster of courses. These students often form friendships that can last a lifetime. From spending extra time after class to discuss concepts to answering questions over email on a weekend, our professors are approachable, accessible, and committed to your success. In addition, OHIO’s Honors Tutorial College offers high-achieving students the option of an instructional approach modeled after the system practiced for centuries at Cambridge and Oxford Universities in Great Britain. Whether you’re interested in studying the plays of Shakespeare in London or retail merchandising in China, OHIO students can choose study abroad opportunities around the world. Early on, you can also participate in meaningful research, internships, and community service or get involved in more than 500 student organizations. We believe experiences outside the classroom are an important part of your success. We look forward to celebrating your achievements—as both a student and a future graduate. 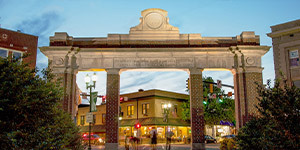 Visit ohio.edu/admissions to learn more. 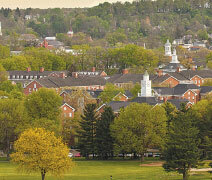 You can also schedule a visit or take a virtual tour of our Athens campus at ohio.edu/tour.